Posted on 03. Jun, 2009 by Corey in All, Dayton Dragons Baseball, General Baseball. This week’s “Where are they now,” focuses on former Dayton Dragons radio broadcaster Owen Serey. He’s currently in his first season as the radio voice of the South Bend Silver Hawks. 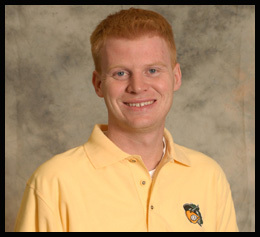 Prior to joining the Silver Hawks staff, Owen spent three seasons (2006-2008) as the Media Relations Assistant and color commentator for the Dayton Dragons. Owen was kind enough to spend some time to answer a few questions for me. Corey Brinn: When do you realize that you wanted to pursue a career in baseball broadcasting? Owen Serey: I always tell people that it was shortly after I realized I didn’t have the God-given ability to play baseball professionally that I realized I wanted to stay in the game somehow. I started keeping the scorebook for my high school baseball team, and eventually worked with the local radio station providing stats for them when they would come out to broadcast our baseball and football games. Working with them, I realized that I knew enough about the game to call the action as well, and decided to make that my major in college. CB: You grew up in Villa Hills, KY, just minutes from Great American Ballpark. Are you, and have you always been a Cincinnati Reds fan? OS: I have been, and always will be, a lifelong Reds fan. Growing up, my family shared season tickets with a group of friends, so I would go to 5-10 games per season. When I wasn’t at the game, I would listen to Marty and Joe on the radio call the game. Now that I’m working for a Diamondbacks affiliate, I’m starting to root for Arizona as well, but I can’t deny that the Reds will always be my #1 team. CB: After receiving your degree in Electronic Media from the University of Dayton, you stayed in town for three more years to work as a broadcaster for the Dayton Dragons. Had you followed the Dragons throughout your college years in Dayton? OS: A lot of people don’t realize that I actually moved away for two years before working for the Dragons. I graduated, and went to work for radio stations in Martinsville, VA and Ashland, KY for a year each before making it back to the Dragons. I owe (former Dragons broadcaster) Mike Vander Wood a lot for taking a chance on me and bringing me in as his assistant despite not having any experience broadcasting Minor League Baseball. As for your original question, I followed the Dragons slightly, but had only been to one or two games before joining the staff. I was never a huge Minor League follower until I started working in the game. CB: What about the Dayton Dragons did you enjoy the most in your three seasons? OS: The people that I met along the way, and that covers a large group, stand out the most. From the front office staff members who treated me as one of their own despite the fact that my job was just seasonal…to the players and coaches who would joke with me and talk to me candidly about the team and the games…to the fans who would stop me after games and tell me how much they enjoyed listening to my call of the action…to the groups I met speaking on behalf of the Dragons Speakers Bureau — whether it be school career days or optimist clubs or nursing homes, one thing they all had in common was they loved the Dragons. CB: How do you think Dragons fans compare to the rest of the Midwest League and Minor League baseball? OS: I think the numbers speak for themselves. Leading the league in attendance every year is remarkable, and to outdraw most double-A and triple-A clubs is unheard of. Being a Reds affiliate helps tremendously, but the fans in Dayton are extremely passionate about the club. CB: Will it feel a bit odd for you to be sitting one booth over in Fifth Third Field as a visiting radio announcer? OS: It will feel strange when I first sit down to call the action, but after traveling around and being in various press boxes throughout the league, you get used to different surroundings. I’ll have to fight the urge to go into the home radio booth and hopefully I won’t make the mistake of walking into the home clubhouse instead of the visitor’s. CB: In the offseason you accepted a job as the Media Relations Coordinator and Voice of the South Bend Silver Hawks. How have things been going for you so far? Have there been many adjustments that you have had to make? OS: First of all, I’m must say that if not for my three years in Dayton working with Mike Vander Wood and Tom Nichols, I never would have had the experience and skills needed to get the job in South Bend. I am also extremely grateful to the Silver Hawks for giving me a chance to be the play-by-play broadcaster and Media Relations Coordinator. I feel my experience in Dayton prepared me well, and the adjustment hasn’t been as difficult as you might think. The biggest change is broadcasting every game and going on every road trip, which certainly takes its toll mentally and physically, but it’s been so much fun that you don’t have time to think about how tired you might be. CB: Where would you like to be in 10 years? OS: Like any minor league broadcaster, my goal is to be a major league play-by-play broadcaster someday. I would love to do that with the Cincinnati Reds, my hometown team, but certainly wouldn’t turn down other opportunities if they come along. In the meantime, I’m fully dedicated to the Silver Hawks and to become the best broadcaster I can. CB: What is the oddest thing that you have had happen while on the air? OS: Where do I start? I’ve called a high school football game from the attic of a concession stand where I couldn’t stand up straight because the ceiling was that low (and I’m only 5’9”). I’ve called a high school basketball game where the phone line I was using was the same line as a phone in the school and had a high school girl pick up the phone and talk to me live on the air. I’ve been hit with foul balls. I’ve been hit in the face with a peanut thrown by a fan. I’ve broadcast a game with a cell phone held to my ear because my equipment failed on me. I’ve had my headset fall apart in the middle of an inning in Dayton which I fixed with duct tape. I’ve had fans stand on seats and hold signs in front of me so I couldn’t see the game. It’s always an adventure. CB: If you were to pick one moment in your entire broadcasting career that means the most to you personally, what would it be? OS: After Opening Day in 2006 – my first minor league baseball game ever – I got back to my apartment in Dayton and checked my email. In my inbox was a message from my parents who had listened online, telling me how proud they were of me and how good I sounded for my first game. To this day, it’s still in my mail folder and I even go back and read it again every few months. It just means so much to have the full support of your family, because no matter what I do in life or whether I have a good broadcast or bad, family always comes first and their love and support is what matters most in life.